I know. Christmas is over. Christmas 2015, that is! I have always wanted to make a Christmas quilt. And this year is going to be the year! Ugly Christmas Sweaters 53" x 53"
This layout shown uses 16 blocks and will finish at approximately 53" square. But I have also included instructions for a few smaller quilts and a layout with one more row of blocks for a longer quilt at 53" x 66". And you could add wider sashing and borders for a bigger quilt. Today's post is an introduction to the quilt along and provides a list of fabric requirements and cutting instructions. Each Christmas Sweater block finishes at 12" square and within each sweater block is a 6" block. Beginning on February 1st, I will be sharing a tutorials for the 6" blocks. But you can use whatever style of 6" block you want, to make your quilt unique to you! 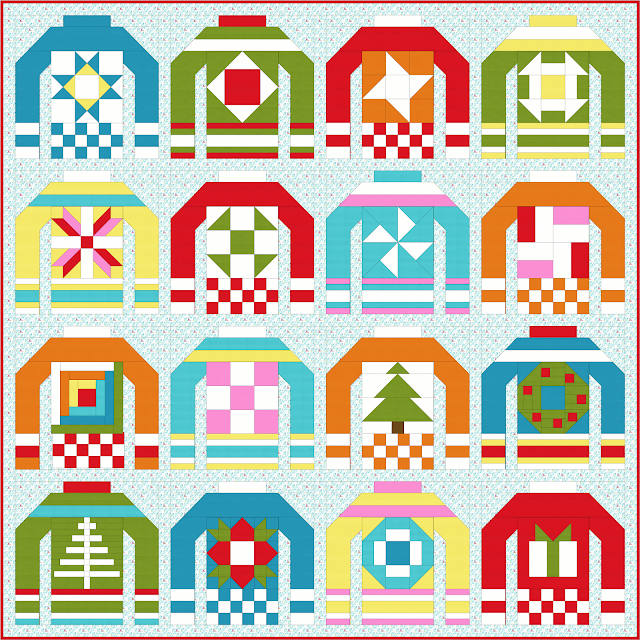 You can click here to go to the Ugly Christmas Sweaters Quilt Along page for all the details and to see the schedule. On that page you will also see the layouts and sizes for the material requirements listed below. Here you can find the FREE Colouring Page for download to make your plan! Measurements based on a 42” Width of Fabric, for the minimum required to the nearest ¼ yard, and do not account for miscuts. WOF = Width of Fabric HST = Half Square Triangle Press seams open. Press as you go. NOTE: If you use the following cutting instructions, you will not need to cut the BACKGROUND pieces listed in the SWEATER BLOCK ASSEMBLY INSTRUCTIONS. If you are using a directional print, you will want to cut the pieces listed with * in reverse. For example: 1.5” x 8.5” Cut an 8.5” strip and cut into 1.5” widths. Cut (6) 2.5” x WOF strips for binding. Prepare your binding and set aside for later. Cut (3) 2.5” x WOF strips for binding. Prepare your binding and set aside for later. Cut (2) 2.5” x WOF strips for binding. Prepare your binding and set aside for later. 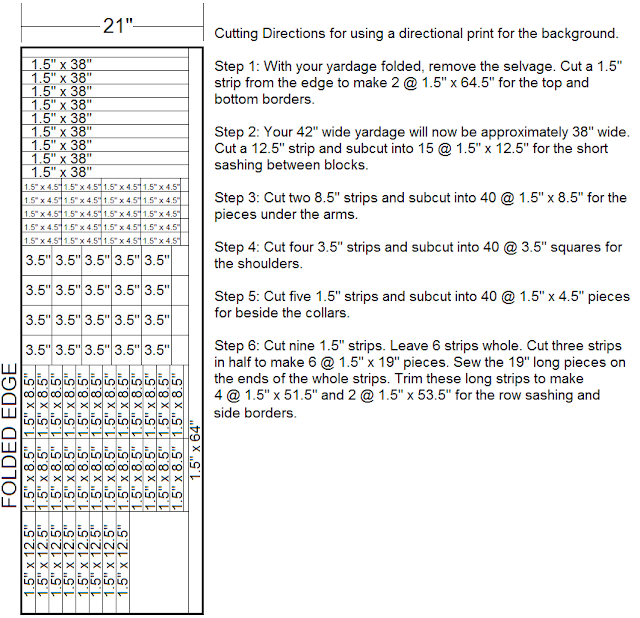 For those who prefer a diagram to aid you in cutting when using a directional print for the background, here are the instructions for cutting the background for the MAXI size quilt. I don't work with prints very often. Solids are so much easier to deal with. Most of them have no right side or wrong side. And they can be upside down or downside right. So easy! So because I chose a directional print for my background, I was out of my element. I posted a quick question to Instagram showing the directional print between the arms and the body of the sweater going in the sideways direction. And asked, "What's your opinion? I'm using a directional print for the background. Would you cut the strips between the sleeves and the body AND the sashing strips to match the direction or not? These strips finish at one inch." Thankfully, my friend Christine of 12450miles.com was brave enough to give me the hard answer. The one you don't want to hear. BUT really do NEED to hear. She said, "I probably would..."
And that sweet Cathy of A Quilting Chick gave the right answer, too. Notice how she agrees with Christine, but adds a dollop of icing? Cathy said, "If it's noticeably directional then yes, I would TRY to. But I'm not about to rip if I mess it up. It adds character and this quilt will be full of character. :)"
Thank goodness for quilty friends! I took my half completed block apart and set to making those prints all point in the right direction. And then adjusted the cutting instructions above to reflect how to cut if you are using a directional print. PLEASE do let me know if the instructions are written clearly and easy to understand or not. I do appreciate feedback. Especially constructive criticism. It helps me to learn and grow! Then grab a button below and share it on your blog! It is not necessary to purchase the pattern in order to participate. But if you would prefer the convenience of using a printable pdf pattern, Ugly Christmas Sweaters is available for purchase and includes complete cutting instructions and a detailed guide to finishing the entire quilt in any of the four different sizes listed. The pattern is available in my pattern store here. My goodness, Lorna, what a fun quilt design you came up with! I am especially drawn to the orange and white "checkerboard" at the bottom of some of the sweaters, it reminds me of my college days. :) This is going to be so fun to watch as others quilt along with you! Lorna - I am sooo looking forward to this 'Ugly Sweater' Sew Along. Not sure how big I will make mine yet, but I love the sizes it will be sewn in and how a 6" block can be inserted. I just don't know how you come up with such cute designs over and over. You ROCK! I'll be sticking around to make a table runner! Thanks! How hilarious and fun is this quilt. I agree about the background, I would want the directions all going the same way unless I make it so that I used it in all four directions, so you would know that I did it on purpose. Sometimes I find that in certain patterns that is the only way to not make myself crazy! Ho Ho Ho - now I get what you mean about ugly Christmas Sweaters. I'm so glad I don't have to actually own one! What a fantatic idea - I LOVE it! But actually, they are pretty cute, Lorna! What a great idea. So clever. My aunt who passed away recently had an annual party with this theme. She would have loved this quilt. I might make one in remembrance, or perhaps a pillow for each of her five children as a remembrance. Thanks! This is going to be a fun quilt. Can't wait to go shopping for some snowflake fabric for the background. i put the button on the side bar of my blog, but it is way too big. Would you make one that is smaller, please. Thanks. I don't need another project, but this is such a fun and clever quilt, I'm going to have to give it a try! Thanks so much for sharing this! Your new quilt along is such a fun design Lorna! What a great way to learn to piece a lot of new blocks too. I won't be able to join, but will be watching with great interest and am looking forward to seeing all the wonderful "ugly" sweaters people create! I LOVE your fabric choices, directional prints and all! Pinned ya! What a fun quilt along Lorna.....everyone needs another Uguly Christmas Sweater!!! I will enjoy seeing what everyone creates!! Oh Lorna... what quirky little sweaters. I might just have to give in and make a few! I love the pacing of this QAL. I might just be able to manage it! I don't want another project. I don't need another project. That's what I'm telling myself in order to resist these Ugly Sweaters, BUT there is no way I can resist these!! I can't wait to start!!! Thanks again for a great pattern!! Don't know how you do it!!!! I was going to skip this as I don't really need another project on the go, but they are so cute, I can't help myself. I think I will try to keep it to a table/bed runner if I can control myself. Thanks Lorna! I wish I had more hours in the day to join...as this pattern just totally cracks me up!! I love it!! Soooo funny!!! Soo fun! I added it to my social sewing calendar: http://swoodsonsays.com/sew-a-long-calendar/ - do you have a specific end date? I'm late to the party but hope that I can still jump on board for your QAL! I really like the idea of placemats, a great way to dress up (or down) my table during the holidays. Your instructions are fantastic. I just received my 2 yards of (directional) background fabric and am a little confused where the different cuts are being used and how to cut it all out of a piece that is approximately 44" wide and 72 inches long. I don't want to cut it incorrectly and then have to order more fabric. Please help!! Thanks. I am an advanced beginner, but need visuals!! Blessings for doing this cute project! 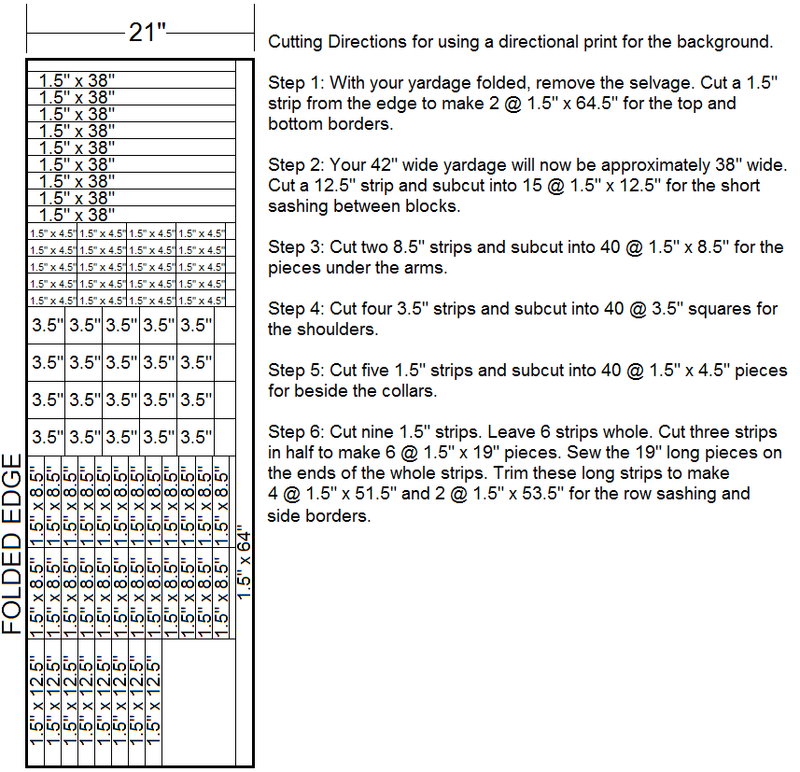 To make things a little easier to understand, I have added diagram to help with the cutting instructions for anyone who is using a directional print for the background. Please note that this diagram is for the MAXI size quilt. 2016 - Year of the Stash!